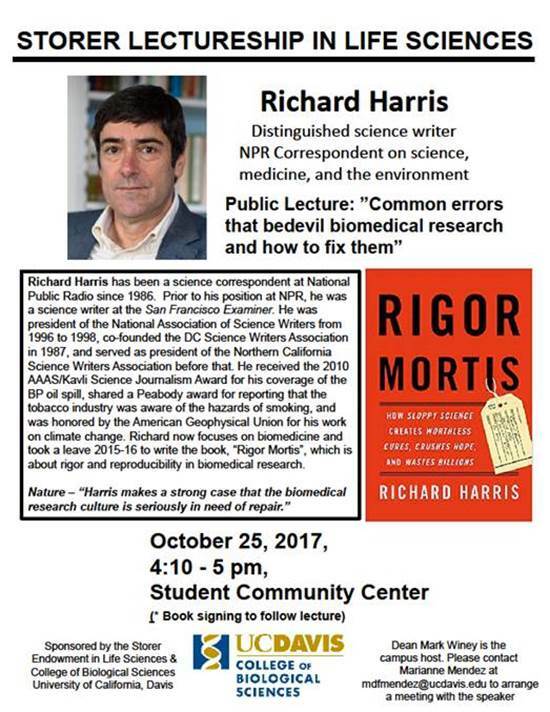 We are pleased to announce that Dr. Richard Harris, Distinguished Science Writer- NPR Correspondent on Science, Medicine, and the Environment, will be presenting the Storer Lectureship in Life Sciences Series, “Common Errors that Bedevil Biomedical Research and How to Fix Them,” at 4:10 p.m. on Wednesday, October 25, 2017 in the Student Community Center, Multipurpose Room. Please see the attached flyer for additional information. Richard will be signing his book, “Rigor Mortis- How Sloppy Science creates Worthless Cures, Crushes Hope and Wastes Billions, ” immediately after the lecture. Author Jonathan EisenPosted on October 2, 2017 October 2, 2017 Categories Misc.Tags Misc.